Introduction: An epidermoid cyst in an intrapancreatic accessory spleen (ECIPAS) is a rare non-neoplastic cyst, typically occurring in the pancreatic tail. 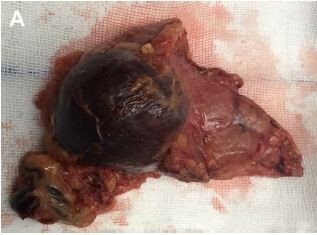 It is difficult to preoperatively differentiate ECIPAS from other types of pancreatic neoplastic cysts. Case presentation: We herein report a case of a 32-year-old man with a cystic tumor in the tail of the pancreas. The patient underwent a laparoscopic spleen-preserving distal pancreatectomy, and histological examination revealed the presence of ECIPAS. In addition, we also performed a literature review of 42 case reports of ECIPAS. Conclusion: Although the preoperative diagnosis of ECIPAS is relatively difficult, familiarity with the imaging features, the clinical presentation and the location of the cyst could lead to a correct preoperative diagnosis of ECIPAS, which might thereby reduce the number of unnecessary resections.